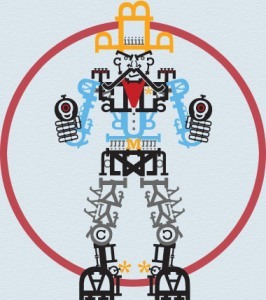 The Sans Sheriff (Lex custos) is half sheriff, and half not sheriff, it thinks, well it's not really sure, you see. Due to a nasty childhood accident involving a broken mirror and a pair of scissors, this monster doesn't really know if it exists or not. Because of this it can be quite easy to defeat. The Sans Sheriff is so plagued with doubt of its own abilities and so pitiful a sight that Heroes usually feel embarrassed and fake their own death so as to not hurt its feelings. 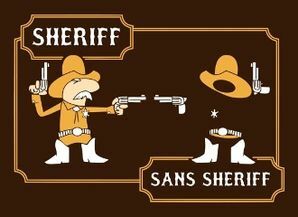 It is hard to describe the Sans Sheriff exactly because this monster cannot see well and cannot dress itself properly due to an aversion to mirrors. Often times it will have its clothing on inside out or backwards, and have its long matted hair covering its eyes. One Field Agent did mail us this sketch of what was reportedly a Sans Sheriff, but it was drawn on the back of a printers help guide and looked rather like this. However we ran the sketch through our spell checker and it came out as FWEJFOMSAKNGFKTJWNC, so we rather distrust what we see. This page was last edited on 12 March 2019, at 01:13.